ABAP Proxy is one of the most remarkable forms of communication between SAP application system and SAP PI. The proxy provides both asynchronous and synchronous mode of communication. In order to utilize Proxy, the application system should have WAS > 6.20. Proxies are used to connect the application system to the PI system. The role of the Business system at the application side is LOC Application system and that at the PI side is HUB Integration server. scenario to describe the collaborative process. The integration scenario summarizes the interfaces required for this collaborative process. 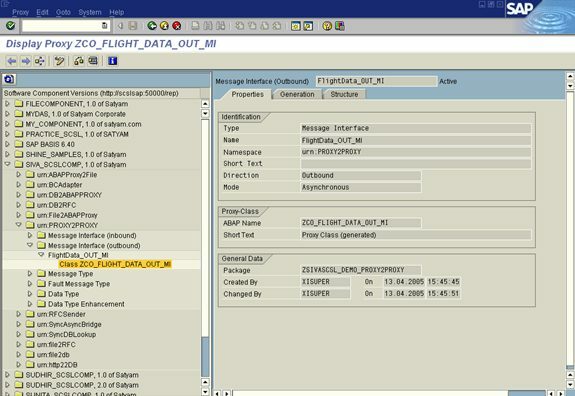 You can use SAP interfaces that already exist in systems, non-SAP interfaces that are connected to SAP Exchange Infrastructure using adapters, or define new interfaces called message interfaces in the Integration Repository. Both worlds can also be interconnected in a collaborative process. All ABAP objects that are created when you generate an interface object from the Integration Repository in an SAP system are called ABAP Proxy Objects. You can divide the different interface objects (the objects from the Integration Repository from which you generate proxies) into two classes: The message interfaces itself and the corresponding parameters and data types. Each generated proxy object can be assigned to its corresponding interface object in the Integration Repository even after generation. The ABAP proxy generation function notes this assignment using metadata, which is transported with the proxy object. Message interfaces can have the mode synchronous or asynchronous. Furthermore, the category of the message interface determines what type of proxy is generated. proxies. They are called to send a message to an inbound interface. 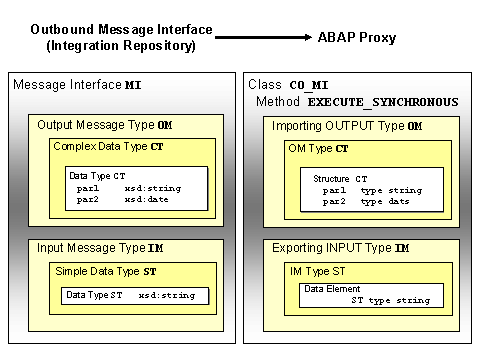 An outbound message interface is mapped to an ABAP object class (prefix CO_). proxies. They are called to start a service that, in the synchronous case, returns a result. 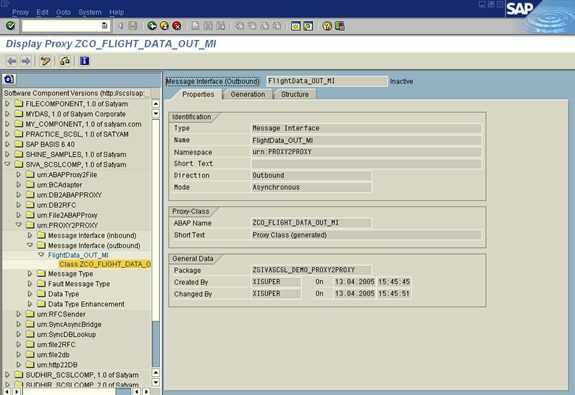 The proxy generation functions generate an ABAP object interface (prefix II_) for an inbound message interface; you must implement this interface using an ABAP object class to make this service available. This class must be recognized by the ABAP proxy runtime so that it can call the appropriate method when a message arrives. The proxy generation function enters an implementing class as the default setting on the tab page Properties; this class is generated after the proxy has been activated. If you want to use a class that already exists, enter it in this field. In the case of synchronous interfaces, the method is called EXECUTE_SYNCHRONOUS. In the case of asynchronous interfaces, the method is called EXECUTE_ASYNCHRONOUS. These names apply, regardless of whether the interfaces are inbound or outbound message interfaces. A proxy class also contains methods for implementing protocols as well as enabling message exchange. The output message type becomes a parameter with the name OUTPUT. The input message type becomes a parameter with the name INPUT. OUTPUT refers to an outbound message, INPUT to an inbound message. Both parameters are structures of the respective message type with a field for the data component of the message. The data component of the message is communicated with by using the message type name. For example, if the message type is Report and it references the data type InvoiceData, then a structure Report of type InvoiceData is generated. Proxy generation saves a reusable data type in the ABAP Dictionary for global XSD data types, for example data elements or structures. It generates fields of a structure for local elements or attributes. The reuse of data types in the Integration Repository is reflected in the data types created in the system. 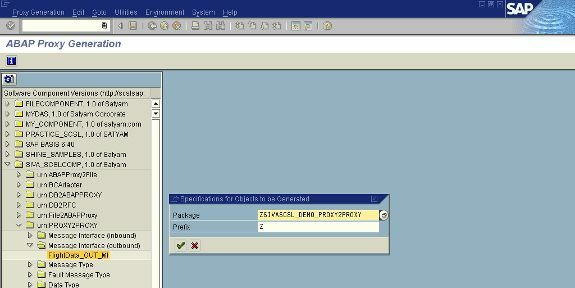 You cannot change ABAP proxy objects manually in the SAP system. 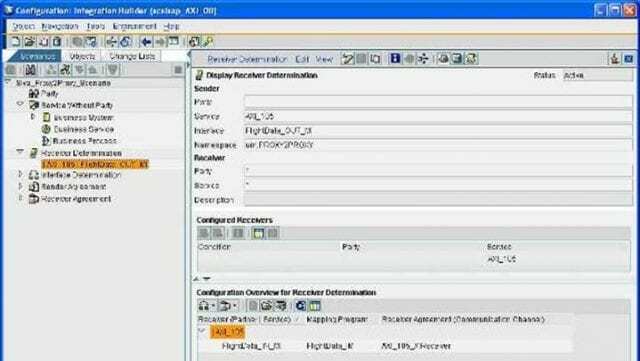 You can only change an ABAP proxy object by using the ABAP proxy generation function. ABAP proxy objects only map data structures defined in the Integration Repository. Therefore, they are not supported and must not be used on the interface. You can generate ABAP proxies for message interfaces that reference RFC or IDoc messages. The generated proxy objects (for example, classes and generated structures) use the name of the message interface that references the message as the prefix in the technical name. The proxy objects belonging to the RFC or IDoc message belong to the super- ordinate message interface and are not reused by the proxy generation function. RFC exceptions are grouped in an exception class. 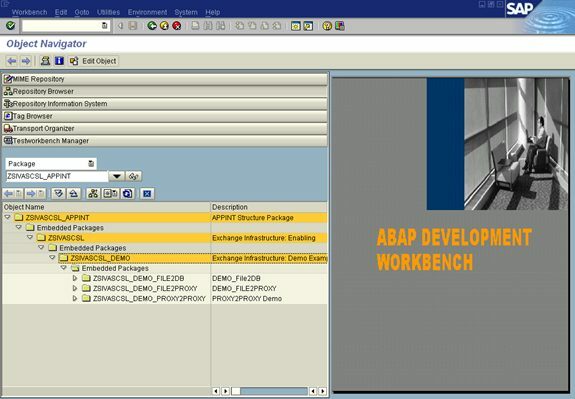 Using ABAP the proxy generation function you can generate ABAP proxy objects to an SAP system from an interface description in the SAP Exchange Infrastructure Integration Repository. 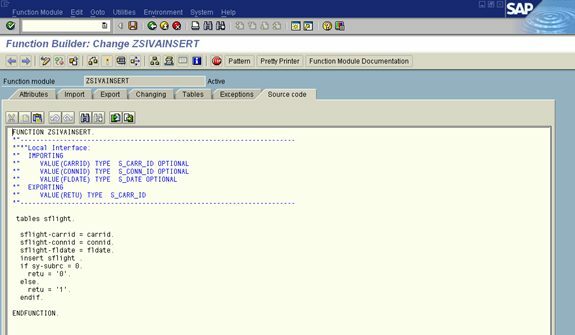 ABAP proxy objects can only be generated for SAP systems that are based on SAP Web Application Server 6.40. The proxy generation retrieves the WSDL description of the interface from the Integration Repository using HTTP. The address of the appropriate server is taken from the exchange profile (parameters 1, 2, and 3 – see below). Queries to the Repository are subject to authentication. The user and password for these queries are also taken from here (parameters 5 and 6). Information used to navigate from the ABAP Proxy Generation to the initial page of the Integration Builder is also taken from the exchange profile (parameters 1, 2, and 4). These parameters are not to be set by developers but by the administrator responsible for the technical configuration of the XI system landscape. You must also have created message interfaces in the interface maintenance of the Integration Repository before you can generate for these proxies. 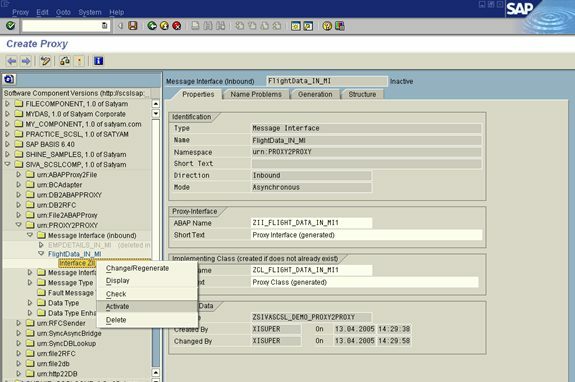 You can send and receive messages using the generated ABAP proxies. 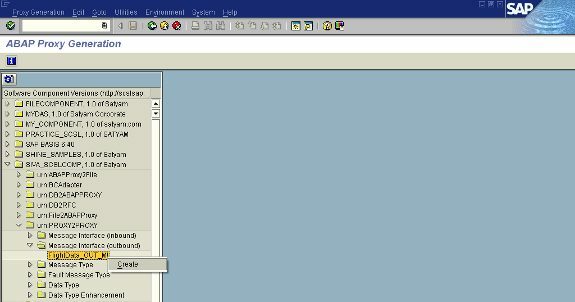 The Object Navigator displays proxy objects created in the system in the navigation tree under Enterprise Services ® Web Service Library (client proxies, server proxies, and proxy Dictionary-objects). When you create new proxy objects, the hierarchy of software component versions from the Integration Repository is displayed in a dialog box. You can display the interface objects from the Integration Repository by using the navigation tree in transaction SPROXY. 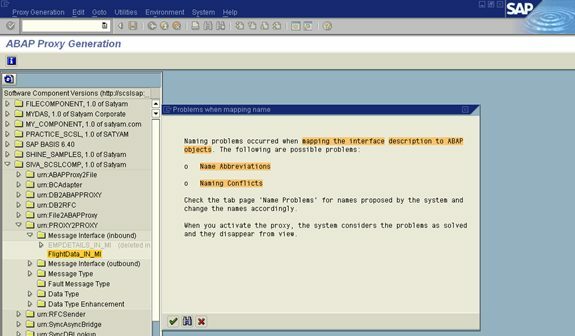 If no connection to the Integration Repository exists, the tree presents an overview of those interface objects for which a proxy object already exists in the system. Properties Generation attributes such as package, last changed by, and so on. For inbound proxies, specify the name of the implementing class here. Name conflicts This tab is only displayed immediately after the proxy is generated. It allows you to correct names that were truncated during generation, or that needed to be changed because a collision occurred. Structure This tab is similar to the Generation tab, except that here the objects are sorted according to their use in a tree structure. Documentation The system displays the documentation from the Integration Repository for the outbound object. Type mappings Even if a proxy was generated successfully, there are cases when generation was only possible due to implicit acceptance (for example, restrictions to the value range are checked by the programmer). If such situations arose during generation, they are listed in an application log. Software component versions and namespaces of the Integration Repository are only displayed if they are available locally in the system. 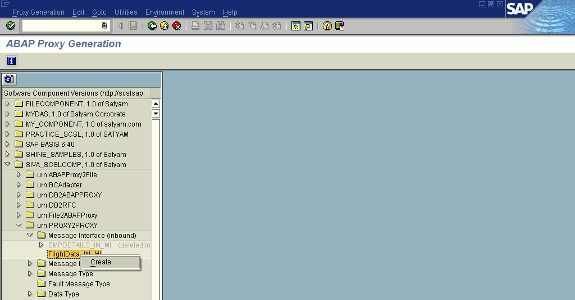 The selection of software component versions in the navigation tree in the SPROXY or SE80 dialogs is also a subset of the software component versions of the Integration Repository. All Generated Objects You can access all proxy objects that have ever been created in the system. You only require this view if namespaces or software component versions have been deleted in the Integration Repository. All generated objects are displayed in the navigation tree in transaction SE80. (Default Setting)You can access all interface objects that are currently visible in the Integration Repository, as well as the corresponding proxy objects. When proxy objects are generated, the number of ABAP Dictionary objects, classes, and interfaces created can lead to a considerable volume of translation. This translation is pointless, however, since these proxy objects do not appear in user interfaces. You should therefore ensure that proxy objects are separated at package level. Create a separate package for the proxy objects and flag it as not relevant for translation. Generate ABAP proxy objects for an interface or for other interface. If a connection to the Integration Repository could not be established at the start of the transaction, you can ascertain more exactly what went wrong, and fix this problem (or have it fixed), by choosing Goto Connection Test. Check whether you need to make any changes following the automatic naming of proxy objects. Call transaction SPROXY and in the navigation tree, either choose the changed interface object itself, or an object that contains the changed object. Call the context menu for this interface object and choose Change Proxy. Client Proxies are generated for Outbound Message Interfaces. These are used to send out Data from SAP system to external Application. Sproxy is the transaction to generate Proxies. The package structure is the most important. The following URL’s will help in understanding the package structure in a better manner. 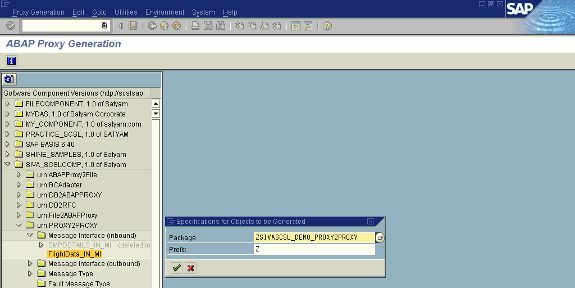 To send a message using the ABAP proxy runtime, call the corresponding client proxy in your application program. ls_response TYPE [Input message type]. * Reference variables for proxy and exception class lo_clientProxy TYPE REF TO [Generated proxy class], lo_sys_exception TYPE REF TO cx_ai_system_fault, * Structures to set and get message content ls_request TYPE [Output message type], ls_response TYPE [Input message type]. 2. Complete the structure ls_request for the request message. 3. Instantiate your client proxy. CREATE OBJECT lo_clientProxy( 'LOGICAL_PORT_NAME' ). LOGICAL_PORT_NAME is the name of the logical port that you want to use, which is used to define the receiver. You can omit this parameter if you are using a default port or the XI runtime. CALL METHOD lo_clientProxy-&gt;execute_synchronous EXPORTING output = ls_request IMPORTING input = ls_response. CATCH cx_ai_system_fault INTO lo_sys_exception. * Error handling ENDTRY. 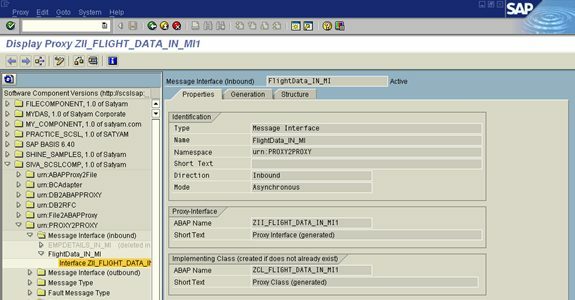 DATA prxy TYPE REF TO ZCO_FLIGHT_DATA_OUT_MI. DATA fault TYPE REF TO cx_ai_system_fault. REPORT ZPROXY_FLIGHT_DATA. 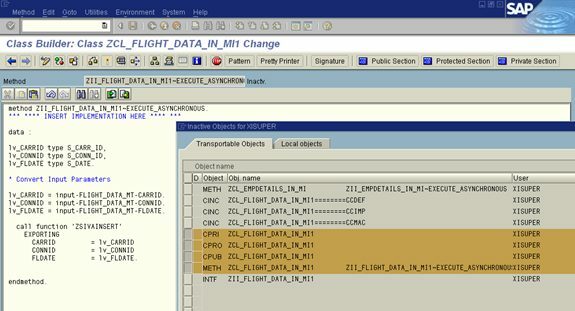 DATA prxy TYPE REF TO ZCO_FLIGHT_DATA_OUT_MI. DATA fault TYPE REF TO cx_ai_system_fault. 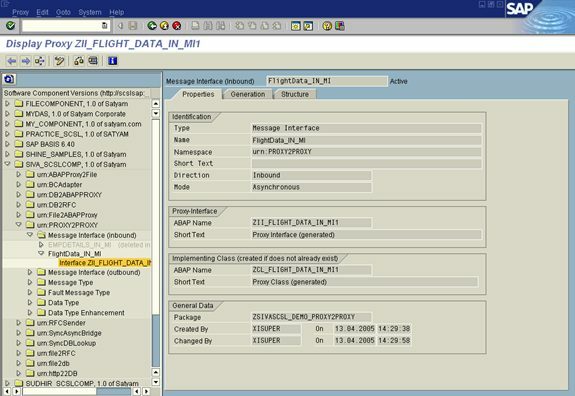 DATA It_request TYPE ZFLIGHT_DATA_MT1. It_request-FLIGHT_DATA_MT-CARRID = 'AA'. It_request-FLIGHT_DATA_MT-CONNID = '0017'. It_request-FLIGHT_DATA_MT-FLDATE = '20040404'. TRY. CREATE OBJECT prxy. CALL METHOD prxy-&gt;execute_asynchronous EXPORTING output = it_request. commit work. CATCH cx_ai_system_fault into fault. WRITE :/ fault-&gt;errortext. ENDTRY. Server Proxies are generated for Inbound Message Interfaces. These are used to Process the Data coming into SAP System from an external application. Sproxy is the transaction to generate Proxies. The package structure is the most important. The following URL’s will help in understanding the package structure in a better manner. 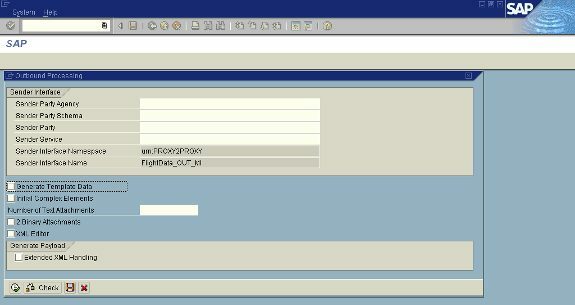 Go to SAP system, Sproxy transaction and select the Inbound interface for which the Client proxy needs to be generated. The following screen is displayed if there are any conflicts with the generated names and already existing names in the system. Go to generation Tab to change the names of the Objects manually. Else the system will take care of the Object naming. A class implementing the Interface is also generated. The methods inside the Class are used to process the data. Click on the method (____Execute_Asynchronous) to write the code to handle the data. *These are local variables used to capture the values that are received as import parameters. lv_CARRID type S_CARR_ID, lv_CONNID type S_CONN_ID, lv_FLDATE type S_DATE. * Convert Input Parameters lv_CARRID = input-FLIGHT_DATA_MT-CARRID. (Local variable)= (keyword)-(Name of the Message type)-(Variable name) lv_CONNID = input-FLIGHT_DATA_MT-CONNID. lv_FLDATE = input-FLIGHT_DATA_MT-FLDATE. * (ZSIVAINSERT is a function module that inserts data into Spfli table) call function 'ZSIVAINSERT' EXPORTING CARRID = lv_CARRID CONNID = lv_CONNID FLDATE = lv_FLDATE. endmethod. Check the data in the table into which the Function module (that is called in the method __Execute Asynchronous) to insert the data.